WHAT IS FLOURLESS FRIED CHICKEN? Flourless fried chicken is exactly what the name implies; fried chicken that requires no flour (almond, coconut, wheat, white, etc.) whatsoever. Before you try to make this recipe, make sure you have the following ingredients on hand. After you have these, you’re ready to make some delicious fried chicken! Begin by heating the avocado oil over medium-high heat. Take a small piece of chicken skin and place it in the oil to check to see if it’s ready to use or not. If the skin begins to bubble immediately, the oil is hot enough to use. Otherwise, continue to wait until the oil is hot enough. Using another small piece of skin, check the oil temperature again. Place half the chicken into the oil and begin to fry. Adjust the heat if necessary; too many and/or violent bubbles means the oil is too hot and needs to have the heat reduced. Turn the chicken around the 10 minute mark. Continue to fry and brown until the skin and outer chicken is a nice golden brown. Remove from the oil, place onto a plate with a paper towel, and season with your seasonings of choice. This topic may be one of the most controversial ones in the world of low-carb/keto cooking. Cooking oils are generally a no-no due to their processed and sometimes inflammatory nature. In fact, this article explores the reasons why vegetable and seed oils can be considered to be inflammatory and unhealthy. Many people advise against using these oils at all on a keto diet. A relative newcomer to the flavorless oil lineup, but is a good choice for use when pursuing a low-carb way of eating. Avocado oil is also very high in healthy monounsaturated fats. Like other oils, avocado oil has no carbohydrates and a high smoke point, making it an ideal oil for keto cooking and/or frying. A high smoke point is required to heat oil to temperatures necessary for frying. Believe it or not, avocado oil has the highest smoke point (520˚F) of any of the refined vegetable and seed oils. On the flipside, any oils with a low smoke point (sesame oil, olive oil, and sunflower oil) should be avoided as they are not only flavored, but are likely to cause a kitchen fire when heated. As a unflavored oil, canola oil is often used in recipes that require cooking or frying in a skillet. The oil is ideal for high-heat situations, as it has a high smoke point. 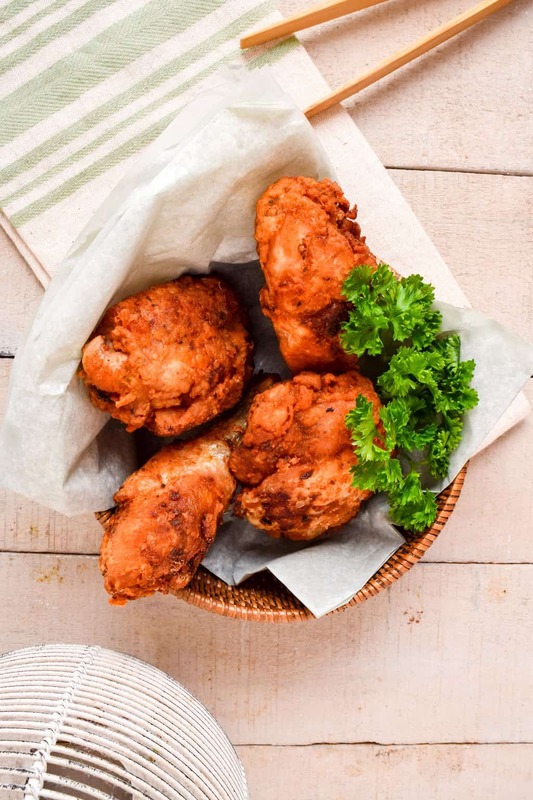 Canola is on the list of inflammatory oils, but is an option for this flourless fried chicken. We use canola from time-to-time, especially when frying meats in a skillet or saucepan. For this particular recipe, using canola oil would be acceptable, since the chicken will be removed from the oil before eating. Some might feel the oil will “work its way” into the chicken and therefore, still be ingested as if it were used as an ingredient. 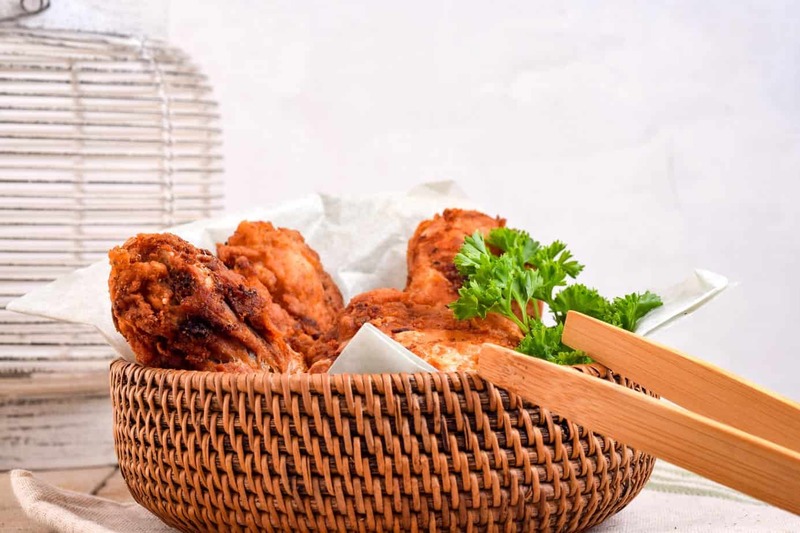 However, we feel that since the chicken is fried in the oil, then removed, the majority of the oil is removed, and therefore can’t be considered to be a main ingredient when eating the chicken. If canola oil all you have, then feel free to use it. After you take your chicken out of the oil, you’ll want to season it quickly to add delicious flavor (especially salt) while the chicken is still hot. Before you place the chicken onto a plate (with or without a paper towel to catch extra oil), make sure to have your seasonings of choice handy. There are plenty of delicious spices to add to your chicken to make it your own. You might even consider seasoning each piece of chicken differently to see what combination of spices you like the best. Here are some spice ideas to get you started! 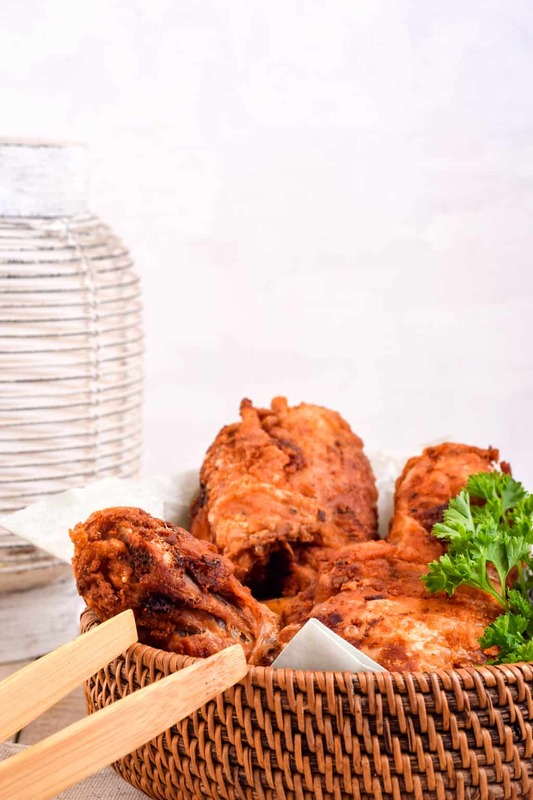 If you find other spices that you love on your keto flourless fried chicken, leave us a comment and let us know! There are tons of delicious side dishes that would go great with this recipe. 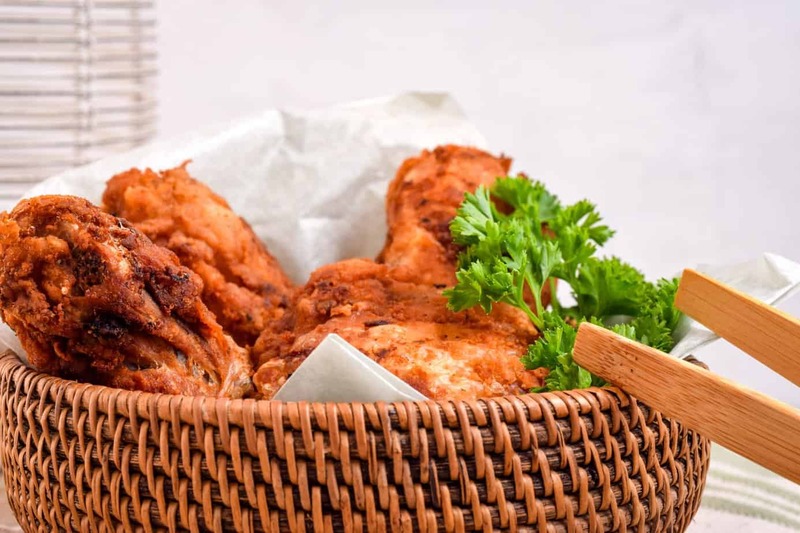 In fact, delicious and savory recipes are just the thing to make any fried chicken that much better. Kitchen Tongs – A good pair (or two) of kitchen tongs is a great tool to add to your kitchen toolkit. For this particular recipe, tongs are essential, as you’ll need to turn the chicken in the oil several times while cooking. A fork would work, but tongs work so much easier. The link above links to a two-pack, each of which is a different length. A longer length is preferable for this recipe. Cast Iron Dutch Oven – Like any other cast iron cookware, a Dutch oven is a versatile and heavy-duty piece of cookware. For this particular recipe, the heavy bottom of the Dutch oven helps to heat the oil evenly, all while providing a wide enough (and deep enough) space to cook the chicken in. If you are a cast iron fan, you’ll definitely want to get one of these.